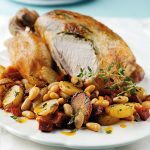 This flavoursome Mediterranean roast chicken with crispy potato and beans has a deliciously tempting herby, smoky flavour thanks to the addition of chorizo and fresh thyme. 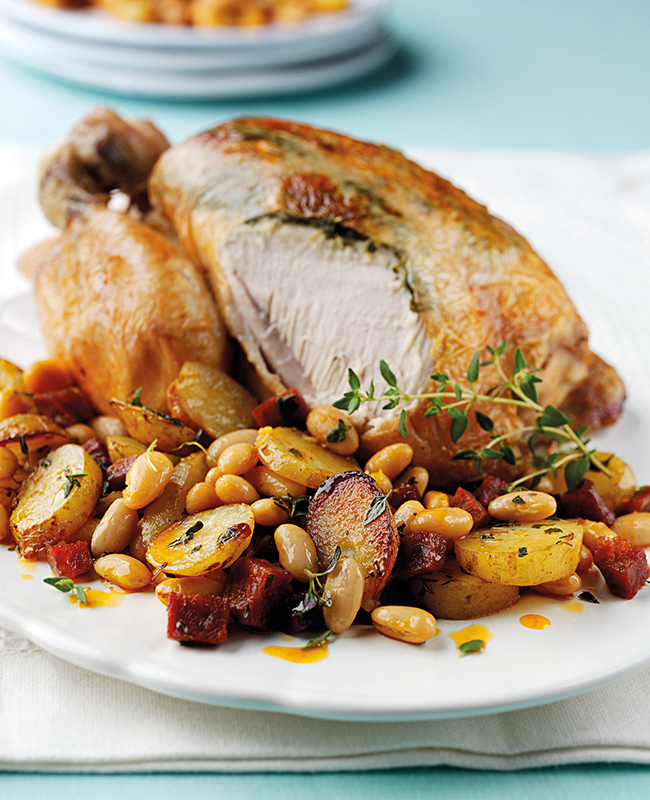 This flavoursome chicken with crispy potato and beans has a deliciously tempting herby, smoky flavour thanks to the addition of chorizo and fresh thyme. Mix together the butter and 1 tbsp chopped thyme. Loosen the skin over the chicken breasts with your fingers, taking care not to tear it. Spread the thyme butter over the chicken breasts under the skin. Place the whole sprigs of thyme in the chicken cavity. Place in a roasting tin and roast for 1 hour. Drain away half the chicken juices, then add the potatoes, beans, chorizo and remaining chopped thyme to the tray, roasting for a further 30 minutes until the chicken is cooked throughout.